Some videos require QuickTime installed on your computer to watch the videos. Video can be watched in any order, however, it is recommended you watch the video in the order presented here by Series. You can also watch/subsscribe to the Gisela Cherry YouTube channel. Series I -- Southwest Michigan Research & Extension Center, Benton Harbor, MI. December 2008. In this video, Lynn Long, Oregon State University Extension introduces the dwarf sweet cherry tree structure on Gisela rootstock. 3 minutes 20 seconds. In this video, Greg Lang, Michigan State University expounds upon the dwarf sweet cherry tree structure as introduced by Lynn Long. 4 minutes 40 seconds. In this video, Greg Lang, Michigan State University, talks about dwarf cherry nursery trees on Gisela rootstocks and how to prune and train them 1st leaf in the orchard. Part 1. 3 minutes 20 seconds. In this video, Greg Lang, Michigan State University, talks about dwarf cherry nursery trees on Gisela rootstocks and how to prune and train them 1st leaf in the orchard. Part 2. 3 minutes 54 seconds. In this video, Lynn Long, Oregon State University Extension explains step 1 -- stubbing cuts -- in pruning dwarf Gisela rootstock cherry trees. 7 minutes 29 seconds. In this video, Lynn Long, Oregon Statee University Extension, explains steps 2 and 3 -- pruning weak wood and tipping 1-year-old wood -- in pruning dwarf Gisela cherry fruit trees. 6 minutes 29 seconds. In this video, Lynn Long, Oregon State University Extension, does some more pruning and prunes the top of the tree (step 4). 5 minutes 28 seconds. In this video, Lynn Long, Oregon State University Extension, demonstrates double-sectoral pruning of vigorous upright shoots. 2 minutes 3 seconds. Series II -- Joe Klein farm, Kent City, MI. December 2008. In this video, Greg Lang, Michigan State University, talks in general about the fruiting habit of sweet cherries on Gisela rootstocks. 3 minutes 11 seconds. 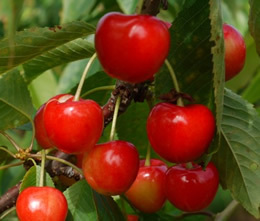 In this video, Lynn Long, Oregon State University Extension, shows how pendant woodin trees on Gisela rootstocks produces inferior cherries and how to prune it out. 4 minutes 0 seconds. In this video, Greg Lang, Michigan State University, looks at young tree structure and how to prune young cherry trees on Gisela rootstocks to achieve the desired structure. 7 minutes 23 seconds. In this video, Greg Lang, Michigan State University, finishes pruning the young cherry tree on Gisela rootstock including tipping 1-year old wood to prevent overcropping in succeeding years. 6 minutes 15 seconds. In this video, Lynn Long, Oregon State University Extension, does some catch-up/remedial pruning on a 5th-leaf sweet cherry tree on Gisela rootstock and then moves on to step 1 (stub cut) and step 2 (remove weak wood) pruning. 8 minutes 18 seconds. In this video, Lynn Long, Oregon State University Extension, finishes pruning the sweet cherry tree on Gisela rootstock with step 3 (tipping shoots) and step 4 (dealing with the top). He finishes by doing some spur removal to prevent overcropping. 6 minutes 39 seconds.